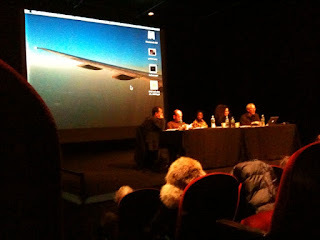 Tonight I went to a panel at School of Visual Arts (thanks to Art Fag City’s lovely tweeting!). I’ve been going to panels whenever possible and this one in particular was quite interesting. One issue I have with panels happens to also be something that continuously draws me back; the slight disorganization and unpredictability of how long someone tends to speak. In this case Hou Hanru, director of exhibitions and public programs at the San Francisco Art Institute, while well-versed in curatorial expertise, his presentation was a bit too long for my taste. Contrarily, Thelma Golden (chief curator of the Studio Museum in Harlem) was extremely effective, succinct and direct, not only regarding the knowledge she shared, but also in her choice of projected images. 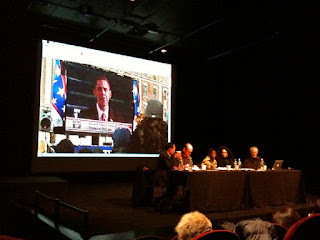 The background image below is a still of Obama during his inauguration speech, shown via NY1, outdoors on the streets of Harlem. Her imagery, greatly illustrated her point regarding time, communication, information and technology. While in one sense technology can be isolating, depending on circumstance and particular situations in which it is viewed or experienced, carries with it a global allowance that can be felt at “home”. Thelma, in my opinion was the most effective speaker of the evening and while having a great rapport with David Ross, former director (and then supporter of her controversial exhibit Black Male: Representations of Masculinity in Contemporary Art) of the Whitney Museum of American Art, brought up issues that not only felt relevant in regards to globalization and the diaspora, but also in reference to modernism and what “post” means in an era of global culture spreading exponentially within the art community. Sitting at the panel, I found myself inspired with new ideas and art possibilities. It often happens when absorbing, listening to topics that not only intrigue but stimulate my own thought processes. Looking at my watch more then once (and being aware of having to catch a train), I started to think about time, and the vastness of digital versus analogue. My new watch is a Betsey Johnson analogue watch which is aesthetically cute, but offers a strange visual experience since I have used digital for so long. Looking at a watch face and the numbers 1-12 along with “hands” is a way of reading and communicating the measuring of hours, but in contrast a digital watch has more possibility for not only accuracy but also usage of numbers. I’ve been using military time since living in Italy. There, stores, museums, churches, and restaurants all operate on military time and once I became accustomed it started to make more sense since we do have 24 hours in a day. So in a moment while listening to great contemporary minds while thinking of the amount of global culture that permeates the National space that is America, the measuring of time seems like a parallel (if even a stretch) of “information” dispersal. Concerning modernism, I’m also fascinated by Thelma’s thoughts on an end to cultural signifiers and what is Post-Black, a terminology that spawned in 2001’s “Freestyle,” her first exhibition at the Studio Museum. Both apropos in defining the “post” of now or a movement, based upon recognition and abandonment.